I will be conducting an interview this week with the very accredited Road Racing World about our racing endeavors over the years. This will be a great opportunity to tell our story and how good sponsors help make our racing effort possible. I will be sure to let everyone know what issue the interview will be in. After a hard round at NJ Autolite RIM Racing bounced back to finish the season on a positive note. Autolite RIM Racing’s rider Mike Morgan moved up in the points standings to finish the season in 22nd overall while only attending 6 out of 10 rounds. Saturdays race ended with a 16th place finish and Sunday’s wet race Mike Morgan rode a solid race and with excellent skill finished 18th. “What a great year for our team and sponsors! The fans, tracks, competitors, and AMA have all been awesome this year. This has been our best season ever and I can’t wait until next year. The off season will be busy but long. I wanted to bounce back after NJ’s not so good weekend here at Barber, and that is what I did. We got the bike ready and the new Yoshimura exhaust worked great. One of my goals this year was to be faster at every track and I have been, the results have proven that. The first race went well and we found a few things in the race that we were going to try in Sundays practice but it rained and I couldn’t try the new settings. The race was good and the boys kept me honest up to the very end, it was good fun and satisfied with 16th place. RIM Racing will return next year and look forward to competing in the AMA Pro Daytona Sportbike series. Following a very successful round 8 at VIR, Autolite RIM Racing had a difficult weekend during round 9 of the AMA Pro Daytona Sportbike held at New Jersey Motorsports Park. Both races involved crashes but Mike Morgan soldiered on in race 1 and finished a solid 21st after rejoining the race. Race 2 positioned Mike in a 5 bike battle for 12th and the race came to an end in a high speed 100 mph crash in the last turn but with 19 lap complete Mike still finished 19th. Catch Autolite RIM Racing September 25-26 for the final round 10 of the AMA Pro Daytona Sportbike series. As hoped Autolite RIM Racing delivered sparks and excitement by achieving their highest finishing results to date during round 8 of the AMA Pro Daytona Sportbike held at Virginia International Raceway. Brought on by nothing more than pure determination, passion, and skill. Autolite RIM Racing’s rider Mike Morgan left VIR with a 14th place finishes in the AMA Pro Racing Daytona Sportbike class. After a race long battle with 5 other riders on Saturday rider Mike Morgan had to settle for a 14th place finish that even saw him running as high as 11th at one point in the race. 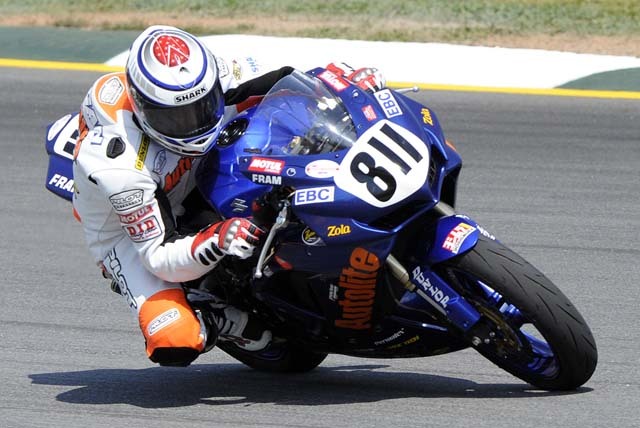 Catch Autolite RIM Racing September 3-5 at New Jersey Raceway for round 9 of the AMA Pro Daytona Sportbike series. The Autolite/Rim Racing team went to Mid-Ohio Sports Car Course for round 6 of the AMA Pro Daytona Sportbike series. After a dismal qualifying session the team knew they had some work ahead of them. Working hard to keep their string of top 20 finishes in order rider Michael Morgan did all he could do during Saturday’s race to hold on and finish 21st despite some small issues. However, back in form and ready to battle the team came back strong on Sunday and finished 18th after a race long battle that could have easily put them in 14th. Catch Autolite/RIM Racing August 13 – August 15 at Virginia International Raceway for round 8 of the AMA Pro Daytona Sportbike series. Fan walk on pit lane. Building on the positive results from the first race in Atlanta, Road American was the best AMA race weekend we have ever had! And this being only the second race of the year for us is very gratifying. Qualifying the Autolite RIM Racing bike in 18th position put me in the best starting position I have ever had! The decals were gone Saturday afternoon this time thanks to Road Americas open track layout for fans. Thanks Autolite, Motul, Barnett, Vortex, DID, EBC, and Hotbodies! The fans really enjoy them. And the DID key chains went over very well for the few lucky fans at the autograph session. Starting from 18th was great. I knew my goal of top 20 was within reach if I could stay with the row in front of me. But the weather for race time was not good. It’s best to race in totally dry or totally wet conditions, but it was starting to rain just before the race started. The problem with RA is its size, at 4 miles it can be raining in one part of the track and not in the other. But my suspension guru, Lenny, calmed me down a bit and we go underway. The new Barnett Cryo clutch I was trying worked great and helped me get a good start. Then the EBC brakes, both pads and rotors, helped me get slowed down and continue to impress as they gain my confidence each time I go out. They are just amazing! On the first lap someone blew an engine to make for even more excitement but they got off the track well and no one crashed. Knowing that staying with someone or a group of riders at this track is important for drafting purposes I hung on for a few laps to the guys in front on me. This worked well until some of them started to make some really aggressive passes on each other. But that worked out well for me. I just let them make the mistakes and took advantage of them. My awesome mechanic, David, was informing me that I was in the top 15 with the pit board. So I was super happy with that and could hardly believe it. So I was well within the top 20 goal. But 2 laps from the end of the race the weather got worse. I saw someone behind me and I tried to keep a good pace. The other rider got by me and on the last lap. But after the weather continued to get worse I slowed down because crashing was not what I wanted to do and ruin my good finish. After a nice 2 wheel slide, first the rear end let go then the front, that lasted a good meter or so I was done trying to repass the other rider! David was waving me to slow down on the last lap because no one else was even close to me. That helped out a lot and I cruised home for my best AMA finish ever! You have to see below. After beating one of my friends the previous day he was all whiney about it and that it was going to be a fight today in the race. It was all good fun and I told him to bring it on! At the start of the race I pulled a monster wheelie that just killed my start. But it was total chaos on the first few laps. Riders running wide in the turns, dive bombing the slow turns, and drafting each other. I got a double draft off 2 riders’ dooking it out side by side down the front straight trying to see who had the faster bike. They were literally elbow to elbow. So I just went on by. Then along come Domonic and I knew he was going to give it his all because I don’t normally beat him. I was just out of reach of another group of riders in front of me and trying to catch them. But then Dom and I started going at it. He would pass me going into turn one, but would blow his exit by going wide. So I would just re-pass him. This went on for 3 laps or so and was great fun! Again David was telling me I was in the top 15 on the pit board, but I don’t have a fancy pit board that tells me the exact position I’m in. Dom got around me on the last lap and my plan was to stay close to him and beat him to the line using the draft. Well the tires or something is not working well this year. On the last lap both of us slowed down and I could see his rear tire was chewed up to. The last corner Dom ran wide and ran off the track a little and I thought I had him, but I did not get the drive because of the tire going off. The drag race to the finish was his by ½ a bike length! We both rode well. 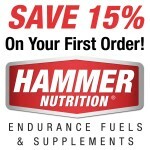 One final note, the products that I use on the bike work so well that some fellow competitors seemed to think we were cheating. So the AMA kindly asked us to tear down the bike after Sunday’s race. I found it funny and upsetting all at the same time. Funny because I know we are not cheating and mad because I was not feeling well and that now because we have some support and can do stuff better that they are sore losers! And I run my program on about ¼ of the costs they do. I hope they can get use to it! Because this is only the start!!! The new Autolite Extreme Sport spark plugs helped my privateer bike post the fastest MPH during qualifying at 166.98 mph. Unfortunately that didn’t transition into a stellar overall lap time, but I will work on that. Qualified 24th. 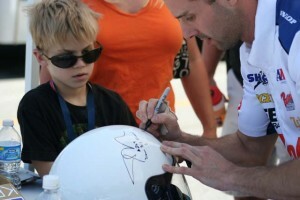 The decals and autograph session went over very well, several fans come back year after year. The new posters were great and we will be changing the pictures with the new ones we got this weekend. As usual the decals were gone by the end of Sunday. Thanks Autolite, Barnett, Hotbodies, and Motul. We will do the same in Wisconsin. The fans love it and are surprised when a smaller team does stuff like that! Our 6 year old daughter does a good job of getting people over for some free stuff. Plus looking forward to OTT (On The Throttle) video interview they did with me this weekend. This year the AMA has reverted back to standing starts for all classes, which is very good! And a fast bike makes for an easier lap time and I knew I could use that as an advantage. The opening laps went smoothly and we maintained a good pace for the opening race of the year for us. I gained a few positions and then settled in too wait for the battle I knew would come towards the end of the race. Another rider was able to capitalize on a small mistake I made but I just waited and followed him around until we got closer to the end of the race. Then I made my move and passed him with one lap to go and pushed for my fastest lap of the race. Finishing in 21st to equal my best finish from last year. This is a great way to start the year. Plus a little TV time that I got on Speed was good also. Feeling good for the 2nd race I got a great start and muscled my way through the turns 2-4 section at the start of the race and was in about 18th place. This set me up well for the rest of the race and a good finishing position I thought. But then on the 5th lap my quick shifter stopped working! This complicated up shifts and I had to do twice as much clutch work with my left hand than normal. So I had to remember how to shift without a quick shifter and do it old school. I was not able to maintain the race pace I knew I could do. But was able to turn some good lap times and finish the race. Not having a Q.S. made for a real long race. This entry was posted in Race News 2010. Bookmark the permalink.